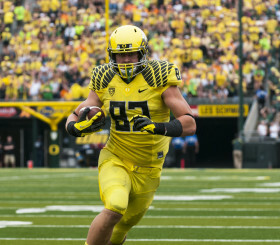 While much has been made of Oregon‘s loaded stable of running backs and solid corps of receivers heading into next season, the TE position has been largely ignored . Unlike other positions on offense, Oregon doesn’t have big name talent at TE outside of the injured Pharoah Brown, who despite being ahead of schedule in his recovery, is not likely to play this season. 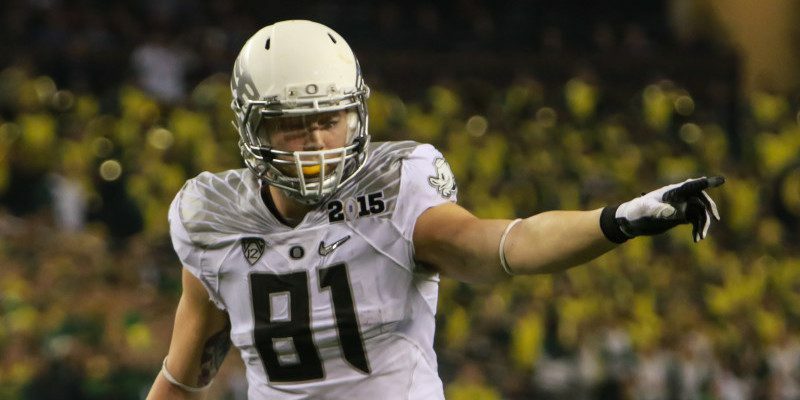 Without Brown, Oregon will have to rely on big play from Rose Bowl standout Evan Baylis. While Baylis showed what he could do in the last two games of the season, that was pretty much the only time he lived up to his potential as a receiver. Baylis has always been known for being a great blocker, making him invaluable in the run game. Should he continue to improve Baylis could be just as deadly a receiver as a blocker. However, Baylis isn’t guaranteed to be the starter when the season starts; he will have to compete with fellow one game wonder TE Johnny Mundt. Mundt’s big breakout game was a memorable one two seasons back against Tennessee. Other than that 121 yard-two TD performance, Mundt has essentially disappeared. This can be likely be attributed to his less than great blocking ability. While Baylis is an excellent blocker who needs to become a better receiver, Mundt could be seen as the opposite. Mundt originally lost out to Baylis after Pharaoh Brown’s injury because Baylis was the much better blocker. If Mundt wants to come in and take the starting TE job from Baylis he will have to improve as a blocker exponentially, because no matter how good of a receiver you are at Oregon, you have to be able to block. Oregon does have a particularly interesting competition at TE going into this next season, having two TEs who have complementary skill sets. It may make sense to just use both of them, subbing Mundt in on passing downs and leaving Baylis in the rest of the time. The problem with this is Oregon’s warp speed offense doesn’t lend itself to substitutions. 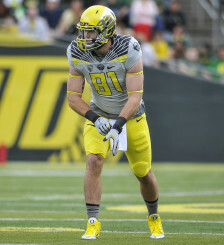 All things considered, Evan Baylis, barring injury, will likely be Oregon’s starting TE this upcoming season, if only because he is the superior blocking TE to Mundt.